Weber is the gold standard of charcoal grills but their gas grills aren’t anything to scoff at. Of course, since it is such a reputable brand, most Weber models come with a high price tag. Which is probably why the Napoleon brand has slowly becoming quite popular among outdoor chefs. This company is Canada’s answer to Weber. Their grills are comparable to the Weber ones in terms of performance and quality of construction. Even better, they usually cost a lot lower. Because these brands offer a lot of similar products, we decided to do a showdown. 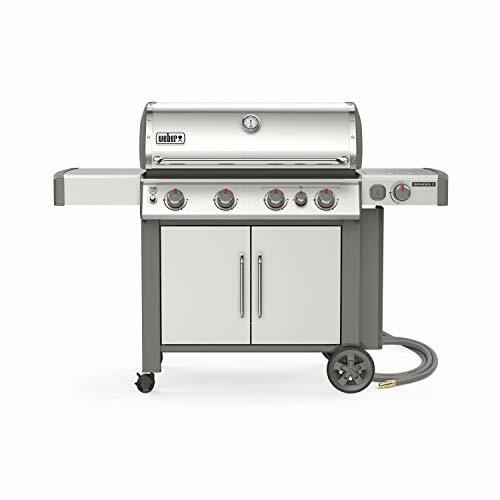 We’ve picked three types of gas grills to compare – portable, mid-sized, and built-in models. Using testing and research, we compare two models from Napoleon and Weber in each category to find out which ones are going to cool best in your backyard. Dimensions: 18.5L x 29.5W x 14.75H in. Our Verdict: the Napoleon TravelQ Pro 285 is the perfect choice for a portable electric grill. These two portable grills both perform exceptionally well. The cast aluminum lid along with the porcelain coated cast iron cooking grates ensure excellent heat retention and distribution. Both grills have split grates that enable you to switch out one for a compatible griddle which increases the versatility of the units. However, the Napoleon model edges out the Weber Q2200 for several reasons. The TravelQ Pro 285 has a slightly bigger cooking capacity and two independently controlled burners. These enable you to cook more food as well as do some indirect cooking. Plus, this grill is much lighter at only 28.5 lbs despite being much larger. It is much easier to transport from the car to the beach and back. Our Verdict: It depends. It all boils down on what your grilling needs are. Obviously, the Napoleon Rogue 425 is a much bigger grill with more power. It has 425 square inches of primary cooking space and a total cooking area of 625 square inches. It features 4 stainless steel burners including an efficient Infrared Sizzle Zone side burner which have a total output of 45000 BTU. The porcelain-coated cast iron cooking grates are excellent at transferring heat while the stainless steel construction provides durability. Foldable side shelves provide extra work space but still keeps the grill compact. 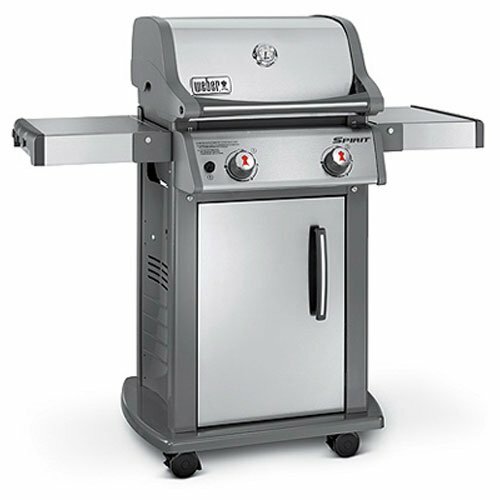 Of course, the same could be said for the Spirit S210 from Weber. Stainless steel construction, porcelain-enameled, cast iron cooking grates, and foldable side shelves. This unit is much smaller with only 2 burners and 360 square inches of primary cooking space which makes this an ideal option if you don’t have much space to spare in your backyard. That being said, each burner in the Weber is much more powerful compared to the ones in the Napoleon. Both grills generally perform the same so your choice will be dependent on how big a grill you need. The Napoleon Rogue 425 is best if you like cooking for big groups while the Weber Spirit S210 is the perfect choice if space is a premium and you only cook for small groups. Our Verdict: If you’re going to go big, then it better be the Weber Genesis II 435. The Napoleon Prestige 500 is undoubtedly a badass grill. It has the capacity to cook 30 burgers at a time using the 4 main burners alone. It also comes with an infrared rear burner and an infrared side burner. And have we mentioned the included rotisserie kit? Talk about versatiltity. 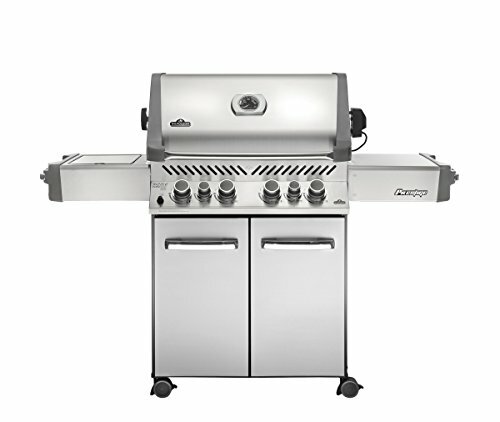 This model features stainless steel construction, a total cooking area of 760 square inches, and a maximum output of 48,000 BTU from the main burners alone. So, why go with Weber? Well, any griller worth his salt (like we are) will tell you that the Genesis II 435 offers much more than that. It has grates with 7mm stainless steel rods for excellent heat retention and transfer. 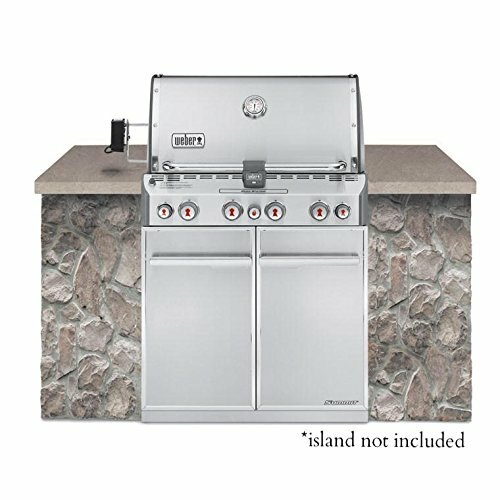 It comes with a sear station burner, a side burner, and 4 stainless steel burners in the main compartment. And while it as stainless steel construction as well, this model comes with a 10-year warranty. When it comes to bang for your buck, you can’t go wrong with the Genesis II 435. 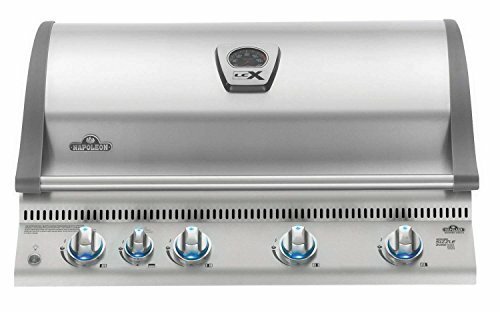 The Napoleon LEX 605 is incredibly huge for a built-in gas grill. With its powerful burners and large cooking capacity, you can easily feed a football team with this baby. The stainless steel build with its chrome accents look very classy. And the heavy duty stainless steel “Wave” grates are great for transferring and retaining heat. 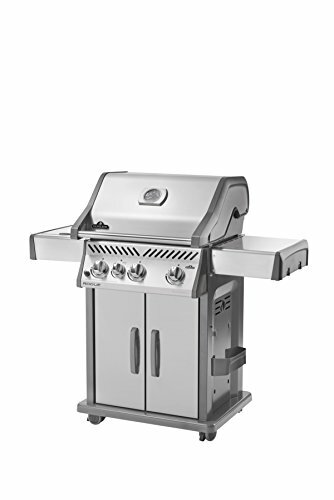 Plus, this model is a lot more affordable, especially when compared to the Weber S-460. This one is smaller. Its burners are less powerful. And it’s more expensive. So, why did we end up with the Weber anyway? 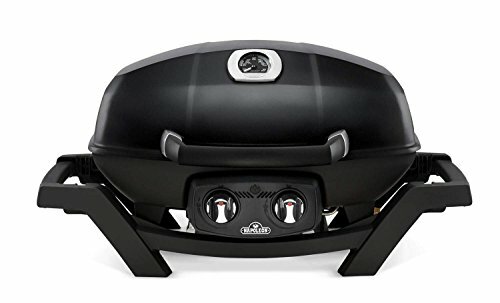 When it comes to grills, you’ll want something incredibly durable, especially at this price point. And the Weber wins that hands down.